I vividly remembered that quote because it resonated with me. I’ve been saying for some time that the next financial crisis will bring a major debt crisis. But as you’ll see today, it is a small part, maybe the opening event, of a rapidly-approaching train wreck. We’ll need several weeks to tease out all the causes and consequences, so this letter will be the first in a series. These will be some of the most important letters I’ve ever written. Something is on the tracks ahead and I don’t see how we’ll avoid hitting it. So, read these next few letters carefully. First, a reminder that today is the deadline to sign up for Over My Shoulder to get the special welcome package we set up for you and a guarantee your $9.95 monthly subscription fee will never go up. As you may know, Over My Shoulder previously cost $179 per year, and that was before all the recent improvements co-editor Patrick Watson and I have made to the service. I truly believe that there is no other research service that will so richly reward you with ideas and insights for your dollar. I’ve been asked if this means Thoughts from the Frontline will go away or become a subscription service. The answer is firmly “no.” I’ve been sending these weekly letters free for almost two decades now. They’re a labor of love for me. However, I still have bills to pay, and the extensive research we do costs a lot. Over My Shoulder is a way to bring in some revenue and amortize those expenses. I could probably charge more, but I view the low price as a “thank you” to my loyal readers. Better yet, I think you’ll find Over My Shoulder useful and fun. It will make you a more informed, intelligent investor in just a few minutes, 3–4 times a week. I hope you’ll give it a try. You can do so by clicking the link below. Try Over My Shoulder for only $9.95 per month. On another note, at the end of this letter I will tell you how I have increased my writing productivity several times over with an inexpensive but amazingly powerful software program. Time is money, so you may also find it valuable. Now, let’s talk about the coming train crash. In 1999, I began saying the tech bubble would eventually spark a recession. Timing was unclear because stock bubbles can blow way bigger than we can imagine. Then the yield curve inverted, and I said recession was certain. I was early in that call, but it happened. In late 2006, I began highlighting the subprime crisis, and subsequently the yield curve again inverted, necessitating another recession call. Again, I was early, but you see the pattern. Now let’s fast-forward to today. Here’s what I said last week that drew so much interest. For those who don’t know Peter, he is the CIO of Bleakley Advisory Group and editor of the excellent Boock Report. Let’s cut that small but meaty sound bite into pieces. 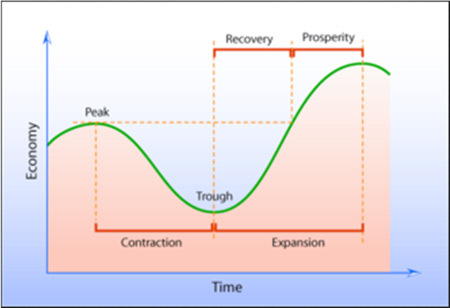 A growing economy peaks, contracts to a trough (what we call “recession”), recovers to enter prosperity, and hits a higher peak. Then the process repeats. The economy is always in either expansion or contraction. Economists disagree on the details of all this. Wikipedia has a good overview of the various perspectives, if you want to geek out. The high-level question is why economies must cycle at all. Why can’t we have steady growth all the time? Answers vary. Whatever it is, periodically something derails growth and something else restarts it. This pattern broke down in the last decade. We had an especially painful contraction followed by an extraordinarily weak expansion. GDP growth should reach 5% in the recovery and prosperity phases, not the 2% we have seen. Peter blames the Federal Reserve’s artificially low interest rates. Here’s how he put it in an April 18 letter to his subscribers. To me, it is a very simple message being sent. We must understand that we no longer have economic cycles. We have credit cycles that ebb and flow with monetary policy. After all, when the Fed cuts rates to extremes, its only function is to encourage the rest of us to borrow a lot of money and we seem to have been very good at that. Thus, in reverse, when rates are being raised, when liquidity rolls away, it discourages us from taking on more debt. We don’t save enough. This goes back farther than 2008. The Greenspan Fed pushed rates abnormally low in the late 1990s even though the then-booming economy needed no stimulus. That was in part to provide liquidity to a Y2K-wary public and partly in response to the 1998 market turmoil, but they were slow to withdraw the extra cash. Bernanke was again generous to borrowers in the 2000s, contributing to the housing crisis and Great Recession. We’re now 20 years into training people (and businesses) that running up debt is fun and easy… and they’ve responded. But over time, debt stops stimulating growth. Over this series, we will see that it takes more debt accumulation for every point of GDP growth, both in the US and elsewhere. Hence, the flat-to-mild “recovery” years. I’ve cited academic literature via my friend Lacy Hunt that debt eventually becomes a drag on growth. Debt-fueled growth is fun at first but simply pulls forward future spending, which we then miss. Now we’re entering the much more dangerous reversal phase in which the Fed tries to break the debt addiction. We all know that never ends well. So, Peter’s point is that a Fed-driven credit cycle now supersedes the traditional business cycle. Since debt drives so much GDP growth, its cost (i.e. interest rates) is the main variable defining where we are in the cycle. The Fed controls that cost—or at least tries to—so we all obsess on Fed policy. And rightly so. Among other effects, debt boosts asset prices. That’s why stocks and real estate have performed so well. But with rates now rising and the Fed unloading assets, those same prices are highly vulnerable. An asset’s value is what someone will pay for it. If financing costs rise and buyers lack cash, the asset price must fall. And fall it will. The consensus at my New York dinner was recession in the last half of 2019. Peter expects it sooner, in Q1 2019. If that’s right, financial market fireworks aren’t far away. "It's the best single source of information from many of the investment industry's greatest thinkers." In an old-style economic cycle, recessions triggered bear markets. Economic contraction slowed consumer spending, corporate earnings fell, and stock prices dropped. That’s not how it works when the credit cycle is in control. Lower asset prices aren’t the result of a recession. They cause the recession. That’s because access to credit drives consumer spending and business investment. Take it away and they decline. Recession follows. The last “Minsky Moment” came from subprime mortgages and associated derivatives. Those are getting problematic again, but I think today’s bigger risk is the sheer amount of corporate debt, especially high-yield bonds that will be very hard to liquidate in a crisis. You see, it’s not just borrowers who’ve become accustomed to easy credit. Many lenders assume they can exit at a moment’s notice. One reason for the Great Recession was so many borrowers had sold short-term commercial paper to buy long-term assets. Things got worse when they couldn’t roll over the debt and some are now doing exactly the same thing again, except in much riskier high-yield debt. We have two related problems here. 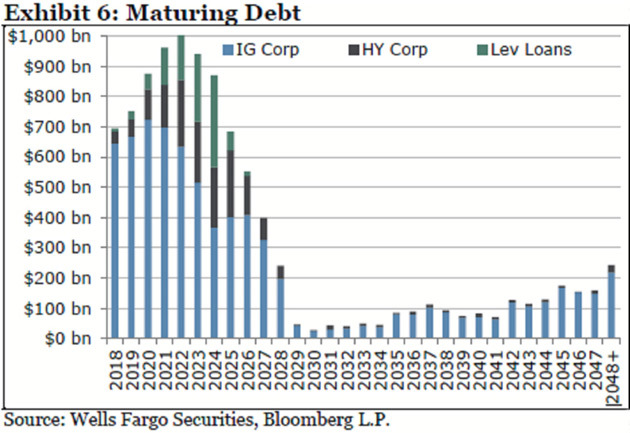 Corporate debt and especially high-yield debt issuance has exploded since 2009. Tighter regulations discouraged banks from making markets in corporate and HY debt. Both are problems but the second is worse. Experts tell me that Dodd-Frank requirements have reduced major bank market-making abilities by around 90%. For now, bond market liquidity is fine because hedge funds and other non-bank lenders have filled the gap. The problem is they are not true market makers. Nothing requires them to hold inventory or buy when you want to sell. That means all the bids can “magically” disappear just when you need them most. These “shadow banks” are not in the business of protecting your assets. They are worried about their own profits and those of their clients. Gavekal’s Louis Gave wrote a fascinating article on this last week titled, “The Illusion of Liquidity and Its Consequences.” He pulled the numbers on corporate bond ETFs and compared it to the inventory trading desks were holding—a rough measure of liquidity. Louis found dealer inventory is not remotely enough to accommodate the selling he expects as higher rates bite more. We now have a corporate bond market that has roughly doubled in size while the willingness and ability of bond dealers to provide liquidity into a stressed market has fallen by more than -80%. At the same time, this market has a brand-new class of investors, who are likely to expect daily liquidity if and when market behavior turns sour. At the very least, it is clear that this is a very different corporate bond market and history-based financial models will most likely be found wanting. The “new class” of investors he mentions are corporate bond ETF and mutual fund shareholders. These funds have exploded in size (high yield alone is now around $2 trillion) and their design presumes a market with ample liquidity. We barely have such a market right now, and we certainly won’t have one after rates jump another 50–100 basis points. Worse, I don’t have enough exclamation points to describe the disaster when high-yield funds, often purchased by mom-and-pop investors in a reach for yield, all try to sell at once, and the funds sell anything they can at fire-sale prices to meet redemptions. In a bear market you sell what you can, not what you want to. We will look at what happens to high-yield funds in bear markets in a later letter. The picture is not pretty. Somehow, lenders thought it was a good idea to buy those bonds. Maybe that made sense in good times. In bad times? It can precipitate a crisis. As the economy enters recession, many companies will lose their ability to service debt, especially now that the Fed is making it more expensive to roll over—as multiple trillions of dollars will need to do in the next few years. Normally this would be the borrowers’ problem, but covenant-lite lenders took it on themselves. The macroeconomic effects will spread even more widely. Companies that can’t service their debt have little choice but to shrink. They will do it via layoffs, reducing inventory and investment, or selling assets. All those reduce growth and, if widespread enough, lead to recession. The problem is that much of the $2 trillion in bond ETF and mutual funds isn’t owned by long-term investors who hold maturity. When the herd of investors calls up to redeem, there will be no bids for their “bad” bonds. But they’re required to pay redemptions, so they’ll have to sell their “good” bonds. Remaining investors will be stuck with an increasingly poor-quality portfolio, which will drop even faster. Wash, rinse, repeat. Those of us with a little gray hair have seen this before, but I think the coming one is potentially biblical in proportion. As you can tell, this is a multifaceted problem. I will dig deeper into the specifics in the coming weeks. The numbers seem unbelievable. I truly think we are headed to a staggering credit crisis. I began this letter describing the coming events as a train wreck. That comparison came up when my colleague Patrick Watson and I were on the phone this week, planning this series of letters. Patrick and his beautiful wife Grace had just come back from Tennessee, and he told me about visiting the Casey Jones birthplace museum in Jackson. 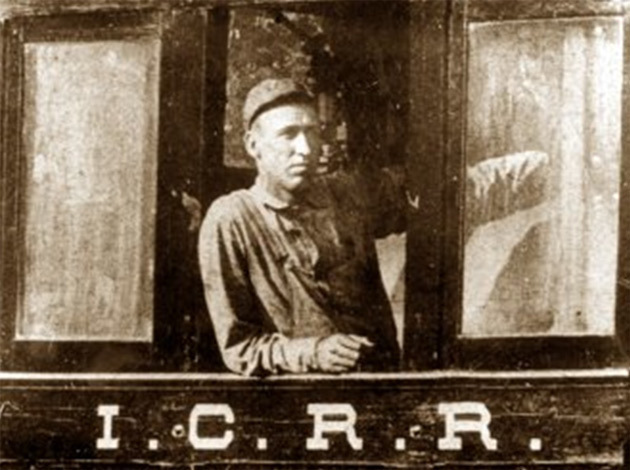 For those who don’t know the story or haven’t heard the songs, Casey Jones was a talented young railroad engineer in the late 1800s. On April 30, 1900, Casey Jones was going at top speed when his train tragically overtook a stopped train that wasn’t supposed to be there. Traveling at 75 miles per hour, Jones ordered his young fireman to jump, pulled the brakes hard, and blew the train whistle, warning his passengers and the other train. Later investigations found he had slowed it to 35 mph before impact. Everyone on both trains survived… except Casey Jones. Right now, the US economy is kind of like that train: speeding ahead with the Fed only slowly removing the fuel it shouldn’t have loaded in the first place and passengers just hoping to reach our destination on time. Unfortunately, we don’t have a reliable Casey Jones at the throttle. We’re at the mercy of central bankers and politicians who aren’t looking ahead. They can’t simply turn the steering wheel. We are stuck on this track and will go where it takes us. Next week, we’ll talk about the sequence of how the next debt crisis will arise, how it triggers a recession, and then $2 trillion of deficits in the US and rising debt all over the world. Which just increases pressures on interest rates and lending. And reduces growth. It is not a virtuous cycle. About ten years ago, I began experimenting with voice recognition technology. For the first few years the software just wasn’t “ready.” Then about four years ago, Nuance came out with a greatly improved version which has since gotten even better. The new Dragon Professional 15 is amazingly flexible with top-of-the-line recognition accuracy. Frankly, Dragon voice recognition technology by Nuance makes me at least three times more productive in my writing. Now, even though I have written millions of words, I am still not all that fast a typist. Dragon has changed that. I don’t often endorse products, but I am so thoroughly satisfied with Dragon that I am comfortable this time. I arranged for Nuance to offer an exclusive 50% discount to my readers that you can access here. If you are a serious writer or simply prefer to answer emails by voice, this is an amazing productivity tool. And it can do so many other things as well. Click here to learn more. After a few minutes of training your own personal Dragon to recognize your unique speaking voice—and becoming familiar with the, well, nuances—I think you will be as happy as I am. After all, who doesn’t want to save time and breeze through your writing three times faster? Try it. My next trip will be to a private conference in Chicago for my friends Swan Global Investments. I’ll also meet with old friend Raghuram Rajan, former Reserve Bank of India head and now on the Chicago Booth faculty. Then I fly to Orange County to speak at the CFA Society on May 17. The next week I go to Raleigh, North Carolina, to see old friends and speak at The Investment Institute. Then at some point in June, I’ll be in Cleveland for an overdue medical checkup with Dr. Mike Roizen. On a personal note, the transition to the new and improved Over My Shoulder has taken me back almost 30 years to when I first hired Patrick Watson as a full-time research assistant. He has been with me through several companies and has worked in others, but now he’s back with me full time. It is very rewarding to have such a long-lasting relationship. He’s probably read more of my writing than anyone I know. Along with a few other changes in my business and personal life, my productivity is already increasing noticeably. I’m very excited about the ways Patrick and I can help enhance your life as well. This week, Pat Caddell was in town for a meeting and came to stay at my home yesterday and share anecdotes. We really hit it off at my conference, and we’re having some fascinating discussions. He is a very interesting, old-school gentleman. It’s time to hit the send button. Somewhere in my travels, I picked up a nasty chest cold that my doctor says will take me about a week to recover from, if I’m lucky. Thankfully it is already improving, but I’ve been taking more medicine and cough drops than I like. This too shall pass, though. Have a great week. May 14, 2018, 3:50 p.m. It turns out that corps. always have about 2/3 of their debt coming due in the next 5 years. Furthermore, the 38% due in the next 5 years is about average and less than at the time of the last recession. In addition, corps. have other loan facilities, cash, etc. if needed in the next recession (which will likely be weak and less than a year in length) to use if necessary. Rates will then recede again before the next recovery. This issue is not onerous for US corporations. May 13, 2018, 7:38 a.m.
Credit spreads are the tightest in years. With debt levels so high, why are the spreads so tight? May 13, 2018, 7 a.m.
Dragon is not only great software but I like the ability to use my digital Dictaphone to take the recording down and then download to my computer later for conversion to Word document. May 12, 2018, 9:31 p.m. While it is hard to choose any one of your excellent musings over the years as more relevant than others, this just may be one. This is a truly important and prescient piece, not just because it offers some new or unique perspective (as you have been discussing this problem in a variety of ways for some time now), but it is the clarity of the individual pieces of this puzzle that are coming together at this time and significantly increasing the risk for a bad outcome. The two charts in your letter, plus the specific details you have described, are most telling, especially when taken in the context of a change in market sentiment. You have highlighted the sheer magnitude of the corporate debt market (and especially HY) and how rapidly it has grown since the last credit crisis in 2008. There is the multi-trillion dollar re-pricing bulge that is coming down the pipe in the next few years, and the consequent hazards this creates should interest rates rise further and eat into cash flows at possibly the wrong time. The chart on corporate debt to GDP has some interesting take-a-ways as well. 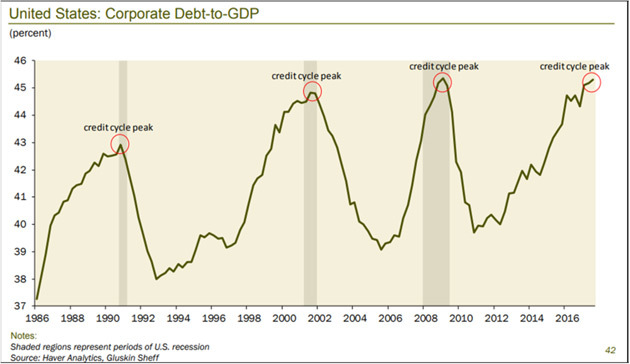 The series of higher lows indicates that the “structural” level of corporate debt is steadily increasing, and should this trend continue, less debt might be shed as compared to previous recessions. The trend line indicates that corporate debt may not go below 40% of GDP this next time around, which leaves less and less room for corporates to maneuver and reposition for the next up-cycle. Also, the peaks of this cycle appear to be rolling over, with the current peak already at the top of the trend line. This all has the look of debt saturation setting in, with its limiting consequences on creating growth and the ability to take on more debt as fuel. Then there are the macro issues that make this time different (but not necessarily in a good way), and potentially more volatile and dangerous. The overall level of debt to GDP, and the potential drag on economic growth that causes; the fact that this phenomena is happening across the developed world, and in many developing countries as well; CB policies that are clearly missing the mark and exacerbating the problems (as you have discussed on numerous occasions); the change to the roles of the banking community as providers of liquidity as a result of misguided regulation; the changes in the composition and temperament of the investor base; and the growing realization that we are now being driven by credit cycles rather than traditional business cycles, among others. Putting aside for the moment what carnage all the covenant lite language might create in a down market, the biggest risks to the economy and investor portfolios are the changes to the structure of the market itself. Regardless of the intentions of Dodd-Frank, the result has been the replacement of good liquidity with bad liquidity. The big banks and investment houses used to be true market-makers (periodic episodes of greed and mis-conduct aside), and would provide liquidity in both good and bad markets. In down markets, transaction sizes may be reduced and bid-offer spreads may widen some, but liquidity was still there. There was also a link between debt issuance and economic purpose, and investors required a fair return for credit risk and performed the balance sheet and business analysis to support those decisions. Now, we have massive quantities of excess liquidity, with limited or no economic linkages, and investors who are chasing yield in a one-way market. The “providers” of liquidity - hedge funds, asset managers and the like - are not market makers and have no underlying business purpose to risk their profitability in difficult markets by providing liquidity to others. This is the bad, asymmetric liquidity that we have today. Making matters worse, investor behavior is in some way mimicking the subprime crisis of 10 years ago. There has been too much hot money liquidity created by both the CB’s and corporations, plus the near total lack of yield on good quality debt, as a consequence of ZIRP, NIRP and other aberrations, that investors have chosen yield over quality. It has been too easy to make money in past years, which is resulting in covenant lite debt, the creation of ETF’s and other investing vehicles with the false sense of “keeping us whole” under all market conditions and demands for redemption. There are two other observations I would like to make that I would be very interested in your take. The first one you touched on, but is one that I think could be the financial weapon of mass destruction should this market rollover. I am not talking derivatives, as Warren Buffett has famously used that phrase for, but instead is modeling risk. The models that are used, and the algorithmic trading that ensues from those models, are not only based on historical data series, but are also filled with assumptions that will completely fall apart when the proverbial stuff hits the fan. This will include everything from the cycles that they model (interest rates, business, GDP, inflation, market patterns, etc.) to the (not so) normal distribution patterns of data and probabilities, to price gapping challenges, and many more. The models will be wrong in many cases, but they will trigger sell signals when selling is under way. This can create a rapidly self-reinforcing sell cycle and put all those issues you mentioned into play. It would be interesting to look at some of the trigger points and estimate how that might impact credit spreads, redemptions, outright loss potential and the like. Lastly, I would like to offer a possible scenario regarding interest rates and their “return to normal” Hand in hand with the observation that we are now in a credit cycle world, interest rate expectations and ranges will be adjusted accordingly. When you are in a business cycle environment, and overall debt levels can still produce positive short-term boosts to the economy (i.e.,overall debt levels are still modest), normal interest rates of 3% over a true economy-wide inflation rate of 2% can be expected to result in short rate of 5% and then a positively sloped curve from there. However, when an economy is saturated in debt, and the economy stumbles along at 1% - 2% for extended timeframes, interest rates are less an economic tool in the traditional sense, and are more of a cash flow and debt management tool (with all the consequent zombie effects). Additionally, no one really knows what inflation is anymore, due to the changing nature of the economy into technology and services, so many of the traditional linkages have broken down. This is yet another problem with modeling risk, but at the CB level. May 12, 2018, 2:45 p.m. In addition to the effects mentioned, what happens when all of the companies that have been buying back their shares to juice up their profit numbers using borrowed money run into problems when debt becomes expensive and cash flow shrinkage makes paying off that debt problematic? Do they then re-issue all of that equity (or go bankrupt, either way) and wipe out the remaining shareholders who have not bolted ship? Given the large numbers of companies who have been in the “buy back using debt” mode, that could make a bad problem far worse. May 12, 2018, 8:25 a.m.
May 12, 2018, 7:08 a.m.
Porter Stansberry of Stansberry Advisory has done substantial research on the potential credit problems unfolding over the next few years. You may wish to review some of his public work on his website. May 12, 2018, 6:26 a.m.
We are never going to escape the debt cycle until the entire system blows up and it has to be rebuilt from the ground up. Thanks to the non-sensical efforts of the FED to revive the economy, we now have a major pension crisis staring us in the face. That is where funds will be needed for economic survival by millions of people, worldwide. The experiment with socialism is headed to the dust-bin.